Despite Bridge of Spies’ impressive awards presence(6 Oscar nods and a whopping 9 from BAFTA), it seems to be one of the least evangelised about frontrunners. It’s easy to see why. Steven Spielberg’s latest is consistently very good, but it has very few, if any, real flashes of breathtaking brilliance. Tom Hanks plays James Donovan, the insurance lawyer brought in to defend suspected Soviet spy, Rudolf Abel, during the height of the Cold War. His defence leading him to a planned prisoner trade in the heart of Berlin. Hanks is effortless in the lead role and he lights up the screen with his token Hollywood charm. However, if awards are to go by, the real talking point here is Mark Rylance’s turn as Abel. Lauded for his stage work, Rylance is starting to make a real mark on the silver screen and, with another Spielberg collaboration down the line (this summer’s The BFG) and Christopher Nolan courting him for Dunkirk, his star is showing no signs of slowing down. Personally, I felt more impressed by Hanks’ charisma than Rylance’s heavily subdued, almost underplayed, supporting performance, but he’s undoubtedly a real master of his craft. In a way, it’s difficult for any of the performers to really stand out because the whole ensemble is practically impeccable, and I don’t think I’ll ever tire of seeing Jesse Plemons on the big screen. That man can do no wrong, in my book. In fact, the film’s consistency arguably ends up softening the film as a whole. As well as impacting on the performances, the overall drama is also tempered somewhat. Spielberg is telling an interesting story here, but rarely one that feels particularly important. It has been said that the Coen brothers’ rewrite added a substantial amount of humour to Matt Charman’s original screenplay. The results are certainly there in the final film, but almost to its detriment. While the comedic additions are well integrated – and, most importantly, funny – they imbue an overriding light-heartedness to an otherwise important story. It works, but it does lessen the dramatic weight of the film. Consequently, we’re left with just two sequences that really raise the pulse: an impressive plane crash and the final showdown on the titular bridge. That final set piece works brilliantly and ties everything together with aplomb. It ensures the measured build-up (the film runs at a slightly bloated 141 minutes) is well worth the wait and it looks stunning. Spielberg’s frequent collaborator Janusz Kaminski (director of photography) frames these final scenes exquisitely. He makes use of a series of bold camera placements that accentuate the dynamic contrast between the characters’ dark clothing and the crisp snowfall, resulting in some striking near-monochromatic cinematography. His visuals elsewhere are also remarkably assured. Glowing doorways are shot with a hazy nostalgia and he handles Spielberg’s swirling snow and streaming rain perfectly. Bridge of Spieslacks some of the magic of its awards competitors, but it’s deserving of its position in the conversation simply for its overwhelming consistency. In that regard, it reminded me of Brooklyn – a film that, coincidentally, hasn’t made quite the same splash – but John Crowley’s film had the benefit of a blinding Saoirse Ronan to really shine out from the film’s sweeping aptitude. 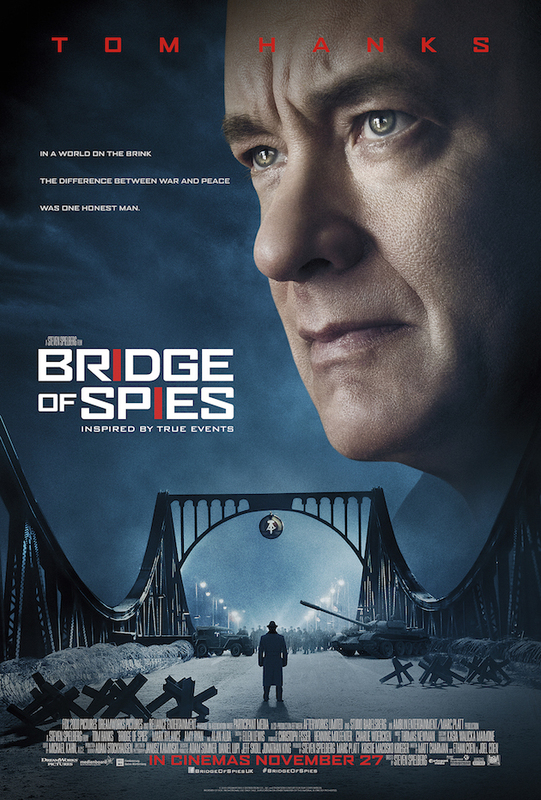 Bridge of Spies is out now on DVD/VOD.